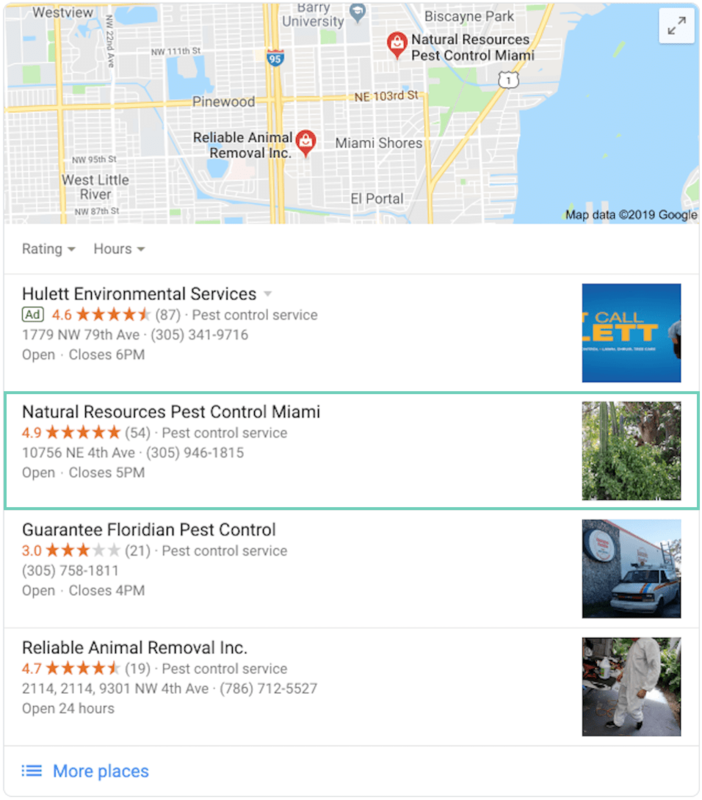 Pest Control Business Citations: How Important are they for local search rankings in 2019? New year, new GorillaDesk. And while 92% of New Year’s resolutions fail, our entire team has resolved to be amongst the 8% that succeed. If you’re reading this post, I’m assuming that you know who we are and more importantly, what we represent. Well, it starts with a renewed commitment to you: our family, clients, and friends. We are 100% dedicated to making it dead simple for you to start, run, and scale your local service business. This means we are going to take you by the hand and teach you how to transform your local business into a million dollar company. That said, if you’re like many of our customers, you may not know where to begin. That’s okay. We recommend that you first focus on dominating the search engine results page (SERP), specifically the Map Pack area. This is especially true if you are strapped for time or money. You see, when a potential customer performs a local search, two organic sections are typically triggered and returned on the search engine results page. They are the search results, and the map results commonly referred to as the Map Pack. The reason why local business owners so highly covet these top three spots is that they stand out from the regular search results and are located at the top of the page just underneath the paid advertisements. More importantly, they give small and medium-sized business owners just like you an opportunity to compete with national competitors in your area. You see, when your business occupies one of the top three spots in the map results, potential buyers immediately trust your business. They know Google (and other search engines) did all the heavy lifting and found the top three businesses for them. As a result, they call your business, schedule inspections, and book treatments… for life. That said, you will not achieve a top three ranking overnight. A whole lot of work goes into featuring your business in the Map Pack area. You have to do the right things, at the right time. Luckily, we’ve identified the very first step for you to take: increase the number of high-quality citations you have.  In this post, we’re going to breakdown what a citation is, why you need them to increase your ranking, and how you can get started today. Pay close attention, and you’ll learn how to rise to the top of the Map Pack and win more business than you can handle. We guarantee it. According to SEO giant, Moz, citations are thought to be the fifth most important factor associated with local SEO. 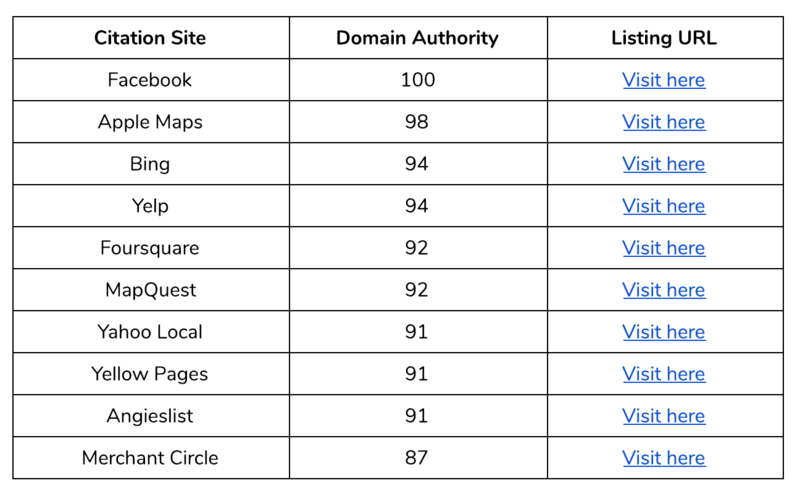 So, if you want to improve your local rankings, it’s clear that citations are important. But what is a citation exactly? In simple terms, a citation is an online reference to a local business. It usually includes the business’ name, address, and phone number (NAP), as well as other relevant details like the hours of operation, accepted payment forms, and more. You might find a citation within a local business directory, or even on a website that’s designed to cater to an international audience. Notice that these results aren’t necessarily associated with the business’ website or dedicated content pages. Instead, these online platforms are essentially directories that list the basic business information we mentioned above. Google crawls local listings and directories to learn more about local businesses. By posting your details (otherwise known as creating citations) to websites that act as ‘directories,’ you give Google the chance to learn more about your business. The more information Google has about your business, the more the search engine will trust your business and your website. This, in turn, gives your business a boost in local SEO which provides you with the chance to rank above your competitors. 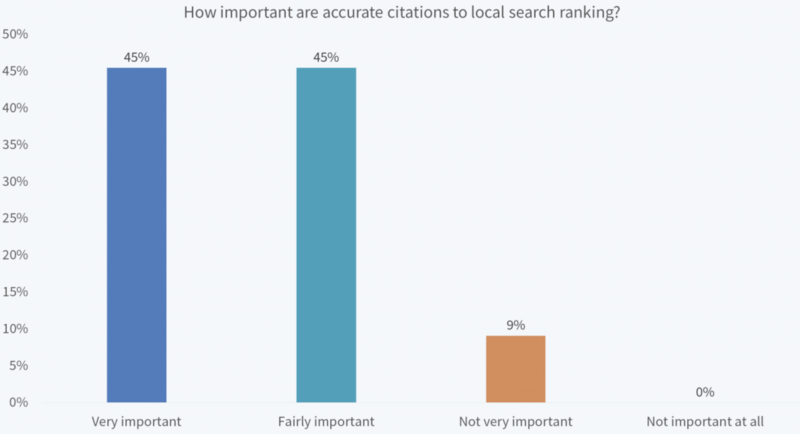 Best of all, the impact of citations on local SEO isn’t just theory. It is a strongly held belief by many local SEO experts around the world. In fact, 90% of local SEO experts voted accurate citations are relevant to local search ranking. In addition to increasing your local search ranking, citations also help you build rapport with potential customers. Of course, this trust can only be established if your citation information is accurate and consistent across all your business listings. 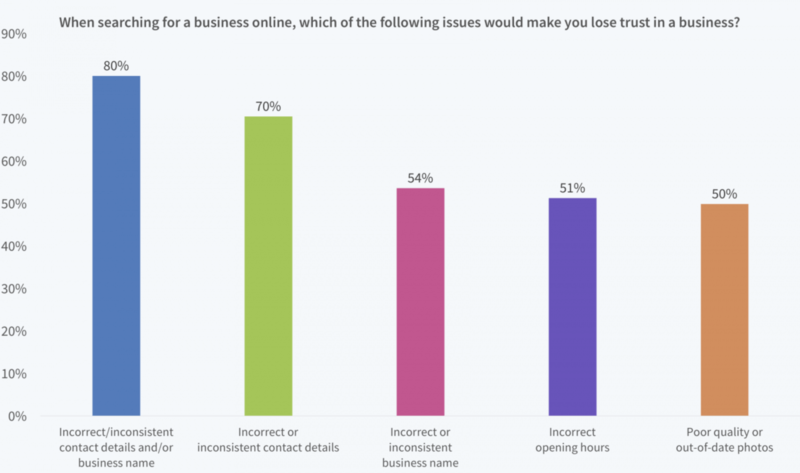 You see, 80% of local consumers voted that they lose trust in a local business, if they find an incorrect/inconsistent business name or contact information during an online search. Don’t let that business be yours. Having incorrect business information across your citations doesn’t just demolish trust with potential customers, it also hurts your bottom-line. In fact, 68% of the local consumers said incorrect information in citations would stop them from using a local service business altogether. Furthermore, 73% of consumers in the 18 to 53 year-old age bracket said they would stop using a local business if their business listings contained false pieces of information. Between genders , men are more likely to stop using a local business with incorrect information. Imagine losing 68% of your potential customers due to inaccurate information. In fact, accurate citations will increase the number of times potential customers ‘discover’ your business, as they’re browsing online. After all, people tend to visit directories to find local businesses. For instance, someone might use Yelp to find a local pest control business. Thus, by having a well-built citation profile, there’s a good chance you’ll experience a rise in the number of inbound leads, alongside the many benefits we already mentioned. How Accurate Is Your Online Information? 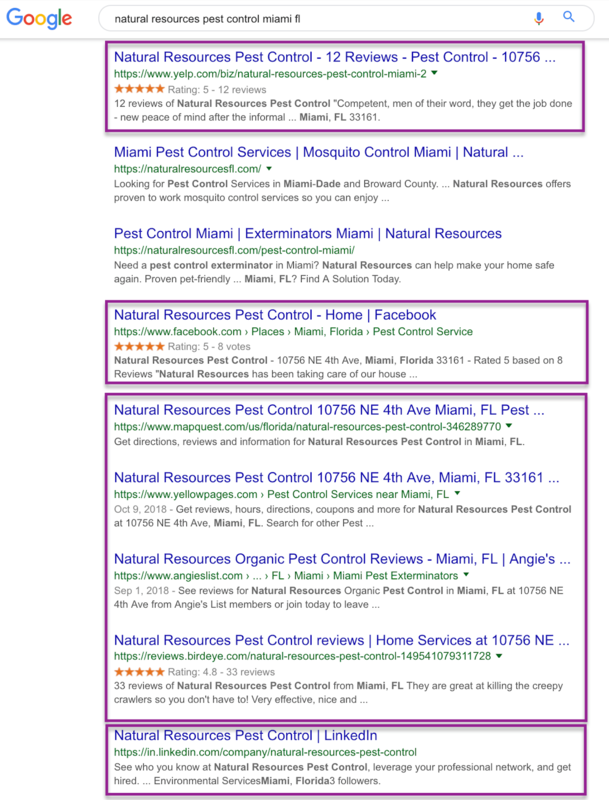 If you want to cultivate a strong online presence for your pest control business, building a collection of quality citations should be a priority. That said, diversification is key. You’ll want to build a mix of the three citation types listed above. And because there is no standard ratio, you should take advantage of any relevant citation opportunity you come across. A study from BrightLocal revealed that businesses in the top three map pack positions have 85 citations on average. The same study also showed that there is a direct correlation between higher numbers of citations and higher rankings on Google’s search engine results page. And while building 85 citations might seem like a tall order, you shouldn’t let this task intimidate you. Once you know how to identify citation opportunities properly, it is not very difficult to build them, just time-consuming. This is why we encourage DIYers to build their citation profile over time slowly. You see, if you consistently build 5 to 10 citations per month, your citation profile will grow to a solid size by year’s end, effectively increasing your local SEO rankings. When building citations, you’ll want to focus on sites that hit on at least one of these factors. If you can hit more than one, it’s a bonus. Standard citations are sites that are important to any local business, regardless of the industry. These are usually the ones with highest domain authority. As the name suggests, these citations are specific to a particular industry. For this post, we’ll be focusing on the ones relevant to pest control businesses. Over the last few years, if anything has changed, it’s that local quality links (local authority sites linking back to your business site) matter even more. By quality, I’m talking relevance, as in topical and location, as opposed to Domain Authority or something like it. 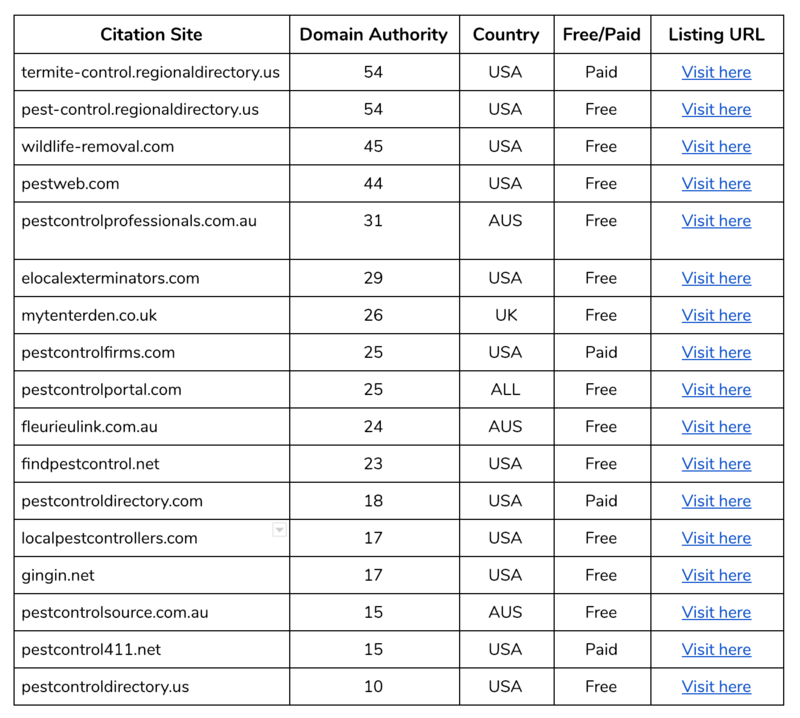 That makes location-specific citations even more critical. Finding location specific citations is as easy– follow the steps below, and you’ll find a number of opportunities to build local citations. Type either “[city name] business directories” or “[city name] business listings” in the search bar. 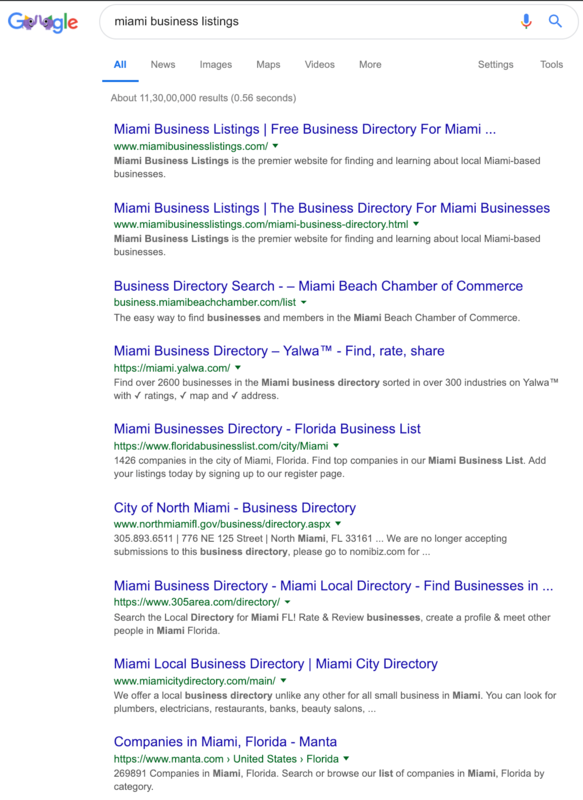 E.g., Miami business directories or Miami business listings. 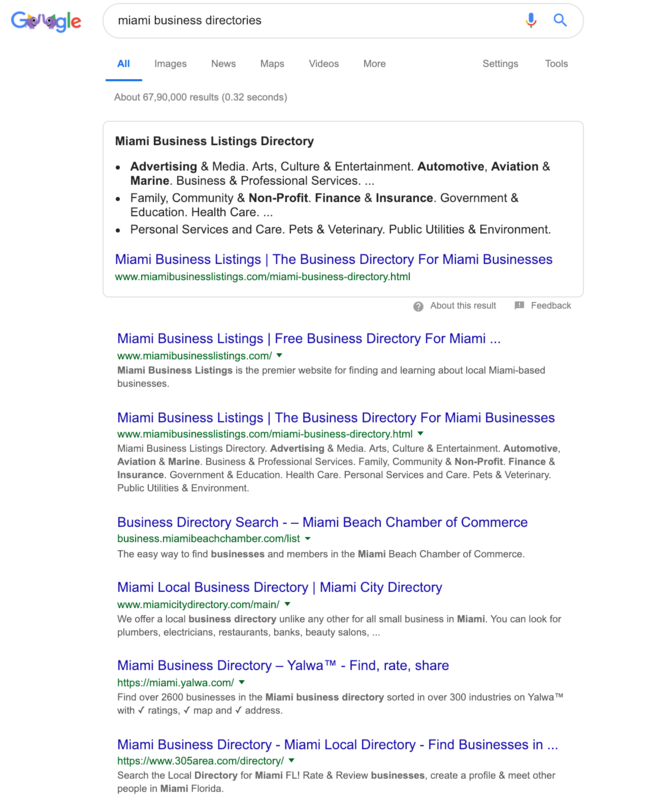 For a business located in Miami, all these websites represent opportunities to gain a citation that’ll help push a local website further up the search listings. What Should You Include in Your Citation? Not every directory will give have the option of entering all the information listed above. Don’t worry about this too much, as the most important thing is that you enter in as much information as you can and that you leave no field empty. Take Your First Step Towards Making The Phone Ring Today! We'll show you how to claim the top 25 citations and skyrocket your map pack ranking in four simple steps. YES, SEND ME MY LIST! From being an advanced Local SEO strategy to table stakes for local service companies eager to win new business; citations have come a long way. With the way SEO looks at the moment, they are still going to be essential and play a significant role in a local SEO strategy in 2019. If you’re new to local SEO, citation building can seem like a daunting task. However, if you take things slowly, and follow the tips provided in this post, you’ll eventually be able to secure the top spot for the kinds of search terms that result in clients visiting your website and calling your local service business. We'll show you how to claim 25+ listings & build a strong citation profile for FREE! Want your phone to ring off the hook? Let us put your business on the map... literally!